A link between the solar magnetic field and weather patterns on Earth may explain our lower than normal severe weather in 2013 | Watts Up With That? From the “science is settled” department comes this new paper that points out a correlation between the Interplanetary Magnetic Field (IMF) and polar jet streams, which drive weather events on Earth. This new paper shows that the effects extend even further towards the Equator than before, meaning it will affect weather experienced by a greater portion of Earth’s human population. 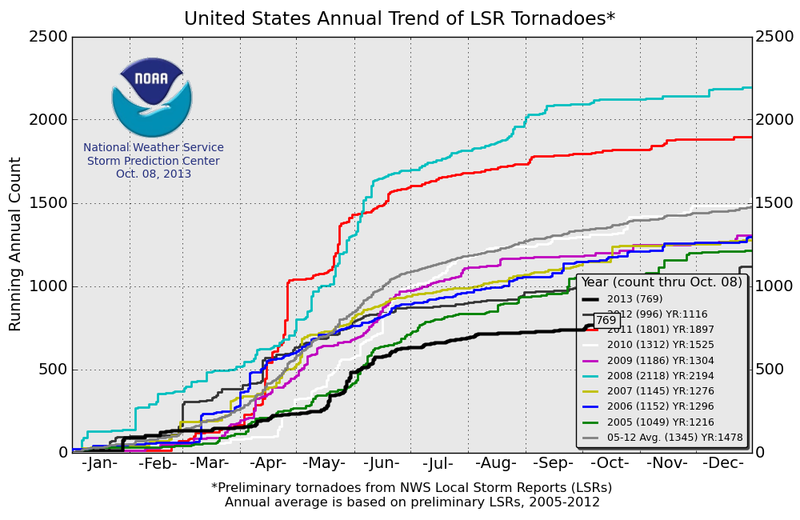 Given that the solar magnetic dynamo has been in a slump as of late, and we’ve experienced a very low U.S. tornado season, one wonders if the low tornado numbers are partially related to lack of perturbations induced in the jet stream, which guide storm tracks and fronts. The effect may also extend to the 2013 Northern Hemisphere hurricane season, which has also been a bust, despite early predictions. The existence of a meteorological response in the polar regions to fluctuations in the interplanetary magnetic field (IMF) component By is well established. More controversially, there is evidence to suggest that this Sun–weather coupling occurs via the global atmospheric electric circuit. Consequently, it has been assumed that the effect is maximized at high latitudes and is negligible at low and mid-latitudes, because the perturbation by the IMF is concentrated in the polar regions. We demonstrate a previously unrecognized influence of the IMF By on mid-latitude surface pressure. 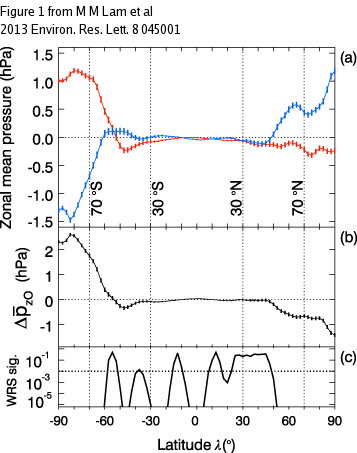 The difference between the mean surface pressures during times of high positive and high negative IMF By possesses a statistically significant mid-latitude wave structure similar to atmospheric Rossby waves. Our results show that a mechanism that is known to produce atmospheric responses to the IMF in the polar regions is also able to modulate pre-existing weather patterns at mid-latitudes. We suggest the mechanism for this from conventional meteorology. The amplitude of the effect is comparable to typical initial analysis uncertainties in ensemble numerical weather prediction. Thus, a relatively localized small-amplitude solar influence on the upper atmosphere could have an important effect, via the nonlinear evolution of atmospheric dynamics, on critical atmospheric processes. provides new evidence supporting a direct relationship with the ionospheric electric potential.
. The variations in V,p,U,l and Lθ are reversed in the Southern Hemisphere. More details are in section 2 of the supplementary data (available at stacks.iop.org/ERL/8/045001/mmedia). Figure 3. Our hypothesis is that the mid-latitude surface pressure is influenced by IMF By via a two-stage process. 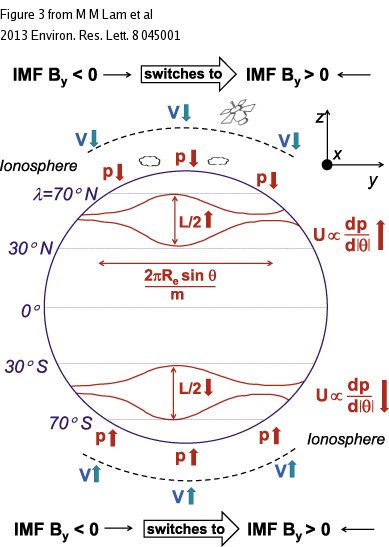 (i) As IMF By changes from dawnward to duskward, the electric potential difference between the ionosphere and the Earth’s surface, V, and the sea-level pressure p, decrease in the northern polar region; (ii) the mean zonal wind U at mid-latitudes increases resulting in an increase in the meridional wavelength (for simplicity labelled L in this figure; in text referred to as Lθ) of the stationary Rossby wave with an integer number of azimuthal waves m (at co-latitude θ and latitude λ = 90° − θ). The variations in V,p,U and L are reversed in the Southern Hemisphere. Previously, proposals to link solar wind variations to significant weather or climate variability have been dismissed on the grounds that the magnitude of the energy change in the atmosphere associated with the solar wind variability is far too small to impact the Earth’s system. However, this argument neglects the importance of nonlinear atmospheric dynamics . The amplitudes of the IMF-related changes in atmospheric pressure gradient are comparable with the initial uncertainties in the corresponding zonal wind used in ensemble numerical weather prediction (NWP)  of ~1 m s−1. Such uncertainties are known to be important to subsequent atmospheric evolution and forecasting . Consequently, we have shown that a relatively localized and small-amplitude solar influence on the upper polar atmosphere could have an important effect, via the nonlinear evolution of atmospheric dynamics on critical processes such as European climate and the breakup of Arctic sea ice . In particular, it affects the structure of the Rossby wavefield, which is key in determining the trajectory of storm tracks . The configuration of the North Atlantic jet stream is particularly susceptible to changes in forcing . In turn, so are the location and the timing of blocking events in this region, in which vortices are shed from the jet stream leading to prolonged periods of low or of high pressure . It has also been proposed that the low-frequency variability of the North Atlantic Oscillation (NAO) arises as a result of variations in the occurrence of upper-level Rossby wavebreaking events over the North Atlantic . The NAO itself is key to climate variability over the Atlantic–European sector stretching from the east coast of the United States to Siberia, and the Arctic to the subtropical Atlantic [28, 25]. Our results may therefore provide part of the explanation for previously observed correlations between Eurasian winter temperatures and solar variability [29, 30], and for the ‘Wilcox effect’ where reductions in the areas of high vorticity in winter storms are seen at times of solar wind heliospheric current sheet crossings  (which are characterized by sharp changes between steady, opposite IMF By states). To me this is an important discovery, particularly since it manifests itself most strongly at the poles, and the opinion of mainstream climate science is that global warming will show up at the poles more strongly via “polar amplification”. Does this mean Coronal Mass Ejections that are not deflected have an impact on the climate? we are getting closer and closer to the solar-climate link. The link that alarmists insist does not exist and therefore could not have contributed to global warming since 1979, or 1900, or LIA. I’m just waiting for Svensmark to chime in and say that it’s not important. A point I’ve made previously is that an equatorward shift of the jets and climate zones results in more global cloudiness, less energy into the oceans to fuel tropical weather systems, less distance available for them to travel and build up power and a more equatorward upper air shear to stop their further growth. Looks like this is vindication of that viewpoint. The next interesting question is as to whether it really is a matter of magnetic field variations or whether those variations have no causative influence themselves but are simply a proxy for other solar changes that do have the effect observed. My view is that it is a matter of upper air chemistry involving ozone and the magnetic field variation would only affect ozone reactions involving charged particles which are directed in along the magnetic field lines. I do not know what proportion of the ozone response to solar variations can be put down to charged particles. I would have thought that wavelength changes would be the more substantial contributor which would not be affected by the magnetic field. Very interesting to see a coupling between the actual shrinking of the ionosphere due to te clear slump in solar activity and the proposed weather effects. The weather effects have been clearly visible for anyone living in the mid-latitudes as can be seen by stronger winters and summers and less tornadoes/mixing of atmosphere since 2008. In any way much of the alarms about AGW giving less snow, more tornadoes etc have evaporated since by reality (well for those who look out of there window). If Northpole ice and global temperature will be affected too is still unclear but I wouldn’t be surprised. IMHO that effect is spurious, although it looked good at the time .. It may not have been spurious after all. Time to reopen such matters with the benefit of modern sensors. At the time of Leif’s ‘spurious’ diagnosis little was known about latitudinal climate zone shifting, changes in jet stream behaviour, ocean oscillations and differential effects of solar variations at different heights and latitudes. Plug all that in and I think it is going to become a lot clearer. Which great Dane did you have in mind? This of course begs the question of what effects may be seen by the same mechanism on longer time periods. You are corrrect, I meant Svalgaard of course. … and it didn’t take long either. Ten minutes. I for one am glad that Dr. S checks in of a work day morning Pacific Time. I suspect that the effect is transient. If the voltage were constant, the pressure would just even out. In other words, I think it matters that the voltage is changing. There may not be a long term effect per se, it may just be the sum of the short term effects. Maybe Piers Corbyn will get more respect now. It seems that no matter what hypothesis is proposed linking solar activity, solar magnetic field, or anything else solar to weather/climate changes on Earth, you are very quick to jump out with “That hypothesis has already been falsified by X (X being some study or other)”. That’s fine, and it is informative. However, what might be more enlightening to the average reader here on this site would be for you to answer what you DO think might actually have an influence on the weather/climate here on Earth. Is it the Sun? If not, then is it CO2? If not, then what do YOU suppose it to be and WHY? It is informative to say when you believe that an hypothesis has already been falsified (although further study using new methods may show that it isn’t as falsified as you might think in some cases), but it is even more informative, in my opinion anyway, to get some insight into what you think truly DOES drive the climate system on Earth here. I get the general impression from the vast majority of your posts that with your vast knowledge of solar physics and solar dynamics you truly believe that changes in solar activity (and all of the other related solar changes, magnetic, etc.) really have VERY little effect on Earth’s climate whatsoever. If that is a true description of your informed opinion, then what do you believe actually DOES control the climate here? (Since you are not a “climate scientist” per se, a simple “I don’t actually know, but it doesn’t seem to be solar-related” would suffice, although it would be somewhat unsatisfying for those of us who are curious). I, for one, greatly appreciate your willingness to share your knowledge on a site like this and to take the time to participate in these discussions. Svensmark vs. Svalgaard… two Great Danes! Thanks for the morning grin! ….if we can’t believe Al, who CAN we believe? Uh, wait a minute…. 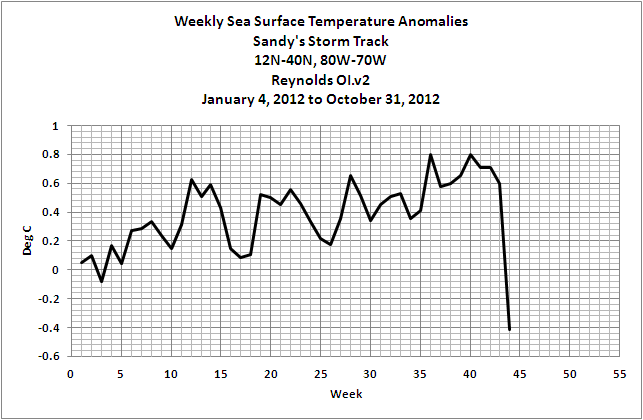 Anybody any idea what effect reduced hurricane (ACE) activity could have on global SSTs? I have been watching these effects since 1982, and the Earth crosses the solar plasma sheet every time the moon declinationaly crosses the equator in either direction, because the changes in the polarity in the solar wind is what drives the North/South declinational movement of the earth/moon system above and below the ecliptic plane, pivoting around the E/M barycenter. 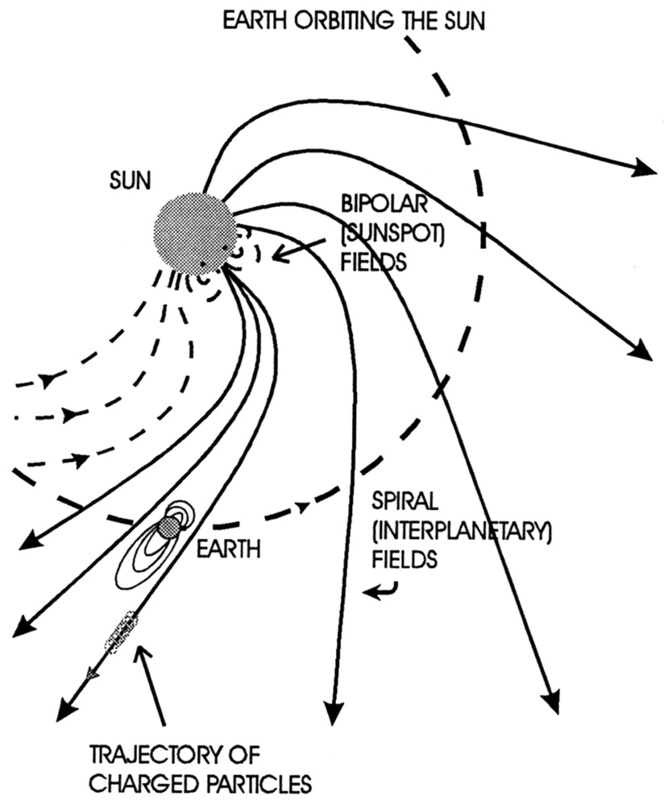 By this method the moon converts the electrical/ion surges in the solar wind that enters the earths magnetic sphere of influence, into a mechanical declinational tidal force that is responsible for most of the MPH incursions, jet stream wanderings and periods, and frontal movement that controls the tracks of hurricanes, tornado, hail, and derecheo sever storms. For years now I have been forecasting long range weather based on these cyclic patterns, and their predictable re-occurrence under very similar conditions. Most of the end effects of these patterns occur in the mid-latitudes where the resulting declinational tidal bulges form at culmination. It is nice to see that some one has opened a door to the understanding of the mechanics of how this all works. It leaves open the research into the specific satellite measurements of the strengths of the interactions, that can be refined to quantify the power spectra of the transfer processes, so they can be used as algorithms to be added to the numerical model forecasts, and advance us past the 7-10 day window limit. Is this not the pet theory of one of WUWT’s resident ‘alternative scientists’?? I seem to have read all this before. Several times in the past I have mentioned a correlation between CME’s and a temporary bump on the UAH daily temperature. With this we could have a mechanism. One possibility is the increase in pressure creates a temporary flattening of the jet streams (they become more zonal). This reduces the cloudiness and increases the solar energy input to the Earth. This would also explain why CMEs don’t always create the temperature bump. If the jet stream was already fairly zonal then the impact would be small. And I might add that I have long championed the idea that our recent cold winters have been due to the European winter jetstream being much further south than usual (and not waving) – thus denying northern Europe of cyclones of warm air, and allowing anticyclonic cold air to drift down from the poles. This paper (together with our reduced sunspot count) would suggest we are in for more anticyclonic conditions in N Europe, with fine summers and cold winters, and less rainfall. In fact, the rainfall may reverse its normal pattern and become more prevalent in summer than winter, because the strong winter anticyclones will resist the cyclonic systems that carry the rain. Reply; Yes that is one of the problems of studying something 25 years before anybody cares about the field due to severe lack of hard data, it is just starting to show up to be used at this time. This is just one area of study that got blocked by the concentration of focus on CO2 studies. I for one, am glad the grant funders are recovering from rectal/cranial encrustation from the past 20 years. Q. Is “important effect” essentially the same as “a meaningfully significant (as strictly used by statisticians) cause”? “This is important!” Has no meaning for a layperson other than puffery, without clarification. THANK YOU, if anyone answers this. 2. in lieu of such a divulging of his hypothesis about climate causation, an explanation of why he chooses to remain cryptically reticent on the subject would be very much appreciated. No one is asking him to tell us the definitive “answer,” just his complete thoughts on the matter (or why he isn’t able to speak freely and completely to the issue). I’ve just realised that if you count your life in solar cycles I’ve only got one and a half left, if I’m lucky. Not certain but would that be me? >i>Time to reopen such matters with the benefit of modern sensors. The sensors [for By and pressure] have not changed, neither has people’s gullibility. what you DO think might actually have an influence on the weather/climate here on Earth. Is it the Sun? If not, then is it CO2? If not, then what do YOU suppose it to be and WHY? In my opinion there has nor been compelling evidence for a Sun/Weather/Climate connection [beyond the trivial 0.1 C effect due to TSI]. I have seen hundreds of correlations come and go [including some of mine]. Any complex system has internal, natural fluctuations, the climate is no exception. Before we discuss mechanisms, the effect has to be demonstrated first, and that has not been done to my satisfaction. Perhaps the bar for what will accept is higher than most peoples, but so be it. I would be interested to hear your opinion on my final report on this? We now have sensors in the oceans and the ability to better monitor temperature changes at different levels in the atmosphere. We can better monitor changes in the particles and wavelengths from the sun. There is increasing realisation that my oft stated comments about shifting jets and climate zones coupled with atmospheric volume changes, variations in atmospheric heights between equator and poles and changes in the speed of net global convection are all capable of adjusting the rate of energy throughput so as to maintain long term balance at ToA whatever internal system variations (including atmospheric composition) do to try and destabilise it. I think you are stuck in an out of date mode of thought. Each time a global warming appologist goes looking for an excuse for missing warmth they seem to find some temporary natural effect at least strong enough to hide the warming. One would think that after looking at the collection of natural effects capable of hiding man-made effects, they might wonder whether the man made effects are important enough to appologise for. At this point my brain sets off the quackery alarm. Localized static electric charges, sure. The rarefied plasma layers of the ionosphere, as hinted by “ion” in the name, sure. But, while the Sun may cause electric current circulation patterns in the ionosphere, that’s on the sunward side. “Global” sounds like it’s an ongoing all-surrounding phenomenon instead of a large but localized effect. And come on, that’s thin atmosphere up there, must be small currents. How much real energy is circulating? Is there enough in a year to power New York City for a day? An hour? How much of a “global” effect can that yield? The conclusions that are being reached from different approaches of tackeling the solar/climate relatioships from the IMF B y component , to the ACI/LOD correlations, to reduced EUV light during prolonged solar minimum periods, plus reconstructions of atmospheric likely circulations during previous prolonged solar minimum periods(especially N.H.) are that the atmosphere’s response is to become more meridional , this results in more more clouds, precipitation and snow cover, and cooler temperatures. Every approach keeps coming up with the conclusion that the atmospheric response to prolonged solar minimum periods or even run of the mill quiet periods, is to become more meridional , which will impact the globe(especially N.H.) with cooling. The question one must ask is if the sun is the main driver of the atmosphere and the oceans it stands to reason if a change takes place to the main driver, it stands to reason the vary items that it drives are going to offer a response. Hmmm. Is this not the mechanism Piers Corbyn claims he uses to make his forecasts? That was an excellent response to a good question. Is there not a concern though, that by being as dismissive of some theories as you are you might miss the possibility that there is a connection worth investigating? I often think that with a system as complex as the climate, there won’t be one single factor that dominates, and if it does it will only do so briefly before a new effect comes into play, as a response to the original influence or not. Therefore, looking for tight correlations may well be a futile and unlikely. If it is an ensemble of interconnecting factors, then they may all need to be investigated before being ruled out. I just wonder if you rule things out prematurely. If you lowered the bar for us briefly, would there be some theories that might yet bear fruit in terms of extending our knowledge on what solar effects other than TSI might have a role to play in our climate? Leif is not going along with al the new solar/climate connection reseach. That is his choice ,so be it. What might have been found is the source of Lorenz strange attractor – butterfly effect. Lorenz’s entire problem was that there was no correlation between input and output in his nonlinear systems. Henry that is so ridiculous. Come on. That appears to be absolutely right. Everyone and his dog is now putting forward proposals for mechanisms that lead to more meridional jets when the globe is cooling and more zonal when it is warming. The fact is that meridionality reduces energy into the oceans and zonality allows more energy into the oceans. That no longer appears to be in dispute outside the AGW circle of natural climate change denial. “all one needs to do is consider the movement of the jet streams in conjunction with the main high pressure systems. If jet streams, on average, are further south then the high pressure systems to the north of them predominate and the globe is cooling. If, on average, they are further north then high pressure to the south of them predominates and the globe is warming”. The chase is now on to narrow down cause and effect. It cannot be anything to do with human emissions because the system went into reverse around 2000 despite increasing emissions. Time will clear up these matters, as this prolonged solar minimum has a very long way to go, and we will find out the climate response and why and what it responded to due to the prolonged solar minimum, which should last till 2040 or so. 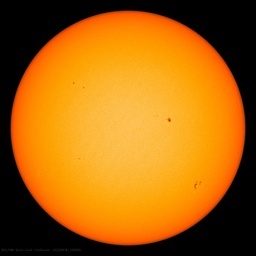 In the meantime I will sit and wait and keep track of all the solar/climate data and see where it takes us. Note that storms lately have not been exploding at T-Max (night time), and instead are responding during T-Min conditions (daytime), which indicates the sun’s heat energy can drive the hot towers during the daytime, but at night they’re shedding their energy too fast, collapsing too soon, with cooler outflows which disrupt the cyclone cores. I keep seeing tropical storm after storm doing this on visible satellite, even when the forecasters and models say there’s a “good chance of intensification”. Molecules of air and water vapor closer together must be capable of radiating heat more effectively. It’s quite simple. Thank you for that answer and – while I appreciate that there has been no evidence of a “grand solar maximum” to explain the recent warming – do you also dismiss the Dalton and Maunder minima links to cold temperatures? These are the ones I consider to be the most indicative of a solar link to temperature variation and which adds weight in my mind to the correlation between sunspot cycle and temperatures. Thanks again, your input is appreciated by many here and I hope you never tire of our responses. Not sure I buy it. There were plenty of hurricanes in North Carolina during the Dalton Minimum. The paper is about By and pressure and the sensors for those have not changed. do you also dismiss the Dalton and Maunder minima links to cold temperatures? I do not ‘dismiss’ anything [apart from the usual pseudo-science that also lives on these pages]. My point is that it has been shown that those minima are related to temperature: There are other minima that do not have a corresponding temperature response, and there are other processes that produce low temperatures, e.g. volcanoes [Tambora is a good example]. in an article published just over a year ago. I should know, since I’ve been ranting about it on the WUWT (as Steven Mosher observed for some years ago). But, hey it is all nonsense, ask Dr. S.
rem: correlation is not causation. These guys have to show where the required energy comes from, the IMF is so week that I rather trust the proverbial butterfly’s flapping wings to start an Atlantic hurricane. Been there , done that, time to move on. you never told me if you agree with my final report? hehe I thought you might like this article vuk. Ah, a mechanism! The engineer in me just loves a mechanism thesis because I sure am sick to death of the statistical drivel coming out of the warmists models and mouths thus far. Henry, sometimes a man has to traverse the science’s Desert of Sinai in company of himself and himself alone to reach clarity of the contemplation. Henry are you ready for the torment and tribulation ? You cannot have cessations or reversals of trends as a system shifts between states while it responds to an ongoing and perhaps increasing stimulus? Au contraire! The simplest example is heating water, the temperature of the liquid form will increase, then temperature will plateau as it transitions to vapor, then temperature will increase again. With chemicals being heated, you can trigger an endothermic reaction that’ll lower the temperature, continue until all of the reactants possible are consumed, then the temperature will rise again. What is so different with this system, that is actually a very complex interplay of many interconnected systems, that an ongoing and increasing stimulus cannot possibly cause a temporary reversal of an effect? Of course our Sun is a major player in Earth’s climate/weather. The main solar “products” being TSI (electromagnetic energy), particles (solar wind and CME’s), the solar magnetic field (as discussed in this article), and good ol’ gravity. It’s just that we know so little about all the interactions, that we cannot always see the connections, let alone predict much. But, I agree, modern technology allows much better methods of collecting and interpreting the facts. The next 30 years should produce an explosion of new solar theories, if we can ever get our establishment science away from their carbon dioxide fantasies. Steven, you are bit of a troublemaker, as a juvenile I use to pull cats tails too. Btw, in my APS link above, k for both pacific events is about half of that for the north atlantic, on the account of the higher frequency. Haven’t you heard? They just changed it the other way. “On average, the tropics will experience unprecedented climate change 16 years earlier than the rest of the world, starting as early as 2020” in Manokwari, Indonesia, Mora said in a briefing with reporters on Tuesday. Since we are talking about hectopascals (1 hPa= 0.0145 psi), let me offer another mechanism for atmospheric pressure affects of interplanetary magnetic fields: Oxygen is fairly paramagnetic (attracted to a magnetic field) and the rest of the atmospheric gases are diamagnetic (repulsed by a magnetic field). Since ozone is also diamagnetic, I have offered the explanation of the polar ozone holes on a few other post comments and a means for falsifying the idea, to wit: higher geomagnetic field strengths at the poles (and now the added interplanetary field) would act to push ozone, nitrogen, CO2 and the noble gases away from the poles toward the equator, but attract O2 toward the poles. With almost 80% of the atmosphere’s composition diamagnetic this should create some extra pressure in the temperate/equatorial zones. Also, the ozone “holes” should coincide with reduced nitrogen and noble gases and a higher O2 filling in the “holes”. Do we have data that shows this variability of the atmos composition over the poles and the equator? If we do, “quod erat demonstrandum” I should think. Oh, great! First they tell us that man-made CO2 affects our climate. Now they want to tell us that the Sun has some effect. What nonsense will they come up with next? It’s the Gods, folks. Thor, Aeolus, Indra, Enlil, Tāwhirimātea, Lei Gong, Mamaragan, Tlaloc, Taranis, Raijin, and all the others. Treat them with respect and things will work out. He has actually explained his temperature forecast method, at least for the UK. He bases it on the beat of 6 double solar cycles and 7 lunar cycles, which should be ~133yrs, but for some reason he uses 132yrs back, and applies roughly weekly CET temperature as a single analogue. That’s largely it. There’s nothing empirical about it. I am waiting for The Comment, from the Maestro of Solar/Lunar/Earth Magnetic Flux effects ….. Piers Corbyn, of Weatheraction, UK. Surely this vindicates his hypotheses and his SLAT techniques ? so, I tended to diss the claime re HAARP and weather influence. what effect would creating plasma balls and bouncing waves round the ionosphere have? maybe none but maybe they do have some effects? like geo engineering, large scale , things might better left alone I suspect. We seem to all accept the fact that the Sun is the primary driver of WEATHER. For example, it is (generally) warmer in the daytime than at night, due to the sun heating the daylight portion of the planet. It is (generally) warmer in Summer than it is in Winter, due to the angle of the sun being able to more effectively heat the Summer portion of the Earth compared to the Winter portion of the Earth (yes, I know, it is the Earth’s axis which causes the angular differential, not the sun, but you get what I mean). It is (generally) warmer at the equator than it is at the poles, again due to that angular thing. Pretty much everyone knows and accepts that on a daily basis, the sun (combined with the Earth water cycle) controls (in close approximation) 100% of our weather here on earth. Therefore, is seems perfectly reasonable to postulate that the Sun (combined with the Earth water cycle, which is solar-driven) would control something on the order of 100% of the Earth’s CLIMATE as well, since climate is really only an aggregation of weather integrated temporally and spatially. In certain camps, the date of future total Arctic ice melt keeps advancing, as predicted deadlines come and go. Their hopes remain for future vindication and so, apparently do yours (albeit in different regard,) in spite of the lack of historical supporting data. Perhaps my viewpoint is wrong that correlative curve- fitting is less than definitive. I always felt a connection with your ideas and your approach to a Sun/Earth connection. Remember when WUWT allowed for voting up of comments, earlier this year? I was surprised when my comment regarding a possible link between solar magnetic influences and the jet stream ended up with 7 votes in about ten minutes. The votes were a clear indication that others were thinking similar thoughts. I can not do the math, yet as my mind sifts information it does at times point in the right direction to connect the dots. You have good manners in the way that you take critiques. I can understand why Dr Svalgaard holds to the strict position of his stance. As one of the current patriarchs of solar studies, he stands guard against frivolous speculation and unsubstantiated claims. That is necessary in maintaining proper order and discipline in the search for ‘the Truth of the matter’. He does not realize that the TRUTH is bigger than he thinks…. Maybe yes, and maybe no as to what he thinks regarding Truth. His position on the science involved though is clearly that of the established position, which he will firmly defend until there is a firm reason for altering that position. That is what makes sense to me about Dr Svalgaard,s stance. I don’t get the impression from him that his entire viewpoint is written in stone, but he is not going to join in with the new wave of thought that you and others are bringing forth. I would bet that he wishes success for you or Vuk in your endeavors. >so, I tended to diss the claime re HAARP and weather influence. but what effect would creating plasma balls and bouncing waves round the ionosphere have? maybe none but maybe they do have some effects? like geo engineering, large scale , things might better left alone I suspect. I thought HAARP was a form of over-the-horizon radar. If you shake the ionosphere isn’t it true that you can identify the location of flying metal objects by inducing a current in them? Then they sing like a canary. If so the only reason to shut it down would be that there is a better replacement. If it was a weather changing machine it would activate the same mechanism described in the paper. With a phased array you could direct the effect to a particular location though to an outsider it would appear to be moving energy everywhere ‘randomly’. It is hard to believe that it would work. I do like your post. I always thought that fitting sine-like curves to a non-linear coupled chaotic (but somewhat cyclical) system made a heck of a lot more sense than trying to fit straight lines to such a system. Weather forecasts, regardless of whether they are 10 days out or 50 years out can generally be made by analyzing old patterns, recognizing when a similar pattern is happening again, and projecting forward. The key is being able to RECOGNIZE when an old pattern is getting ready to repeat itself, which is precisely what you appear to be tying to do. Our friend Mr. Bastardi is quite the master of looking at old patterns and forecasting when they will repeat themselves, and he seems to do a pretty fair job of it, so it seems to be one of the few ways to do forecasting of such a complex system. The great thing about science is that it can be said to be the “search for truth”… However, if you think you actually FOUND the truth, you aren’t doing science anymore, you are doing religion. That’s the whole problem with the CAGW crowd, they actually think that they FOUND the truth, so they are doing religion now. That would be the same as me claiming to be God. I am saying – I am satisfied I figured out enough. I don’t need to know more. I am happy with my big truck and dogs who go with me. I don’t feel guilty anymore abt using more COtwo than others. God is good. Affecting pressures and wind flows..no. I tried in vain a few weeks ago to enlighten one of my tin foil hat- wearing friends as to how much power would be needed for HAARP to create any noticeable weather effect at all, even locally. My friend argued that the Oklahoma tornadoes were a result of HAARP, at a great distance. When told that HAARP is closed, she concluded that “they” have moved it to a secret location. By the way Crispin, you sure do roam around a lot… last week you were in Java. Hope you listened to some good gamelan music. The ‘search for truth’ is a life long quest. ‘Searching for greater understanding’ is a main component of that quest. Several weeks, I followed a link that led to one of the co2 believer science sites, Nucitelli,s maybe. I read through all of the comments to get a better impression of their thoughts. They were into a reasonable science based discussion, except that they were all in agreement with one another throughout the entire thread. For the most part they were puzzling over why nature was not on their side, and looking for ways to prove beyond the shadow of a doubt that co2 was the main climate culprit. After reading about 1/3rd of the comments, I was struck by the fact that every scientific based comment was bound to the ‘belief’ that co2 was primary to understanding climate interactions, no matter which earth dynamic was bought into the discussion. Somehow it reminded me of ‘Waiting for Godot’. Funny how Mosher and Svalgaard are busy commenting on trivial posts but much more circumspect on serious work… BTW the work described here does not need to establish “climate relations”. 4 years of data is plenty since they talk about processes that could explain observed synoptical variations that many are too happy to call the work of “chaos”. And since climate is the sum of weathers, finding the process that controls weather will lead to climate understanding. …important enough to appologise for. Apologize for that, or it’s pistols at dawn. According to HAARP program manager James Keeney, the facility is only temporarily off the air while operating contractors are changed. Given adequate understanding of the atmospheric and oceanic response of the frigid, temperate and torrid zones to highs or lows in the solar signal, correct. The notion that climate drives weather is largely illusory, and is a conclusion that is inevitably arrived at from not accounting for the solar forcing at the scales of weather. the problem with LS and others is that they cannot differentiate between net irradiation and weather. Maxima gives us the best parameter as it really only shows irradiation (sun) and what is allowed through the atmosphere (earth), giving one good proxy. Eventually the weather will follow net irradiation: You can see this clearly in my tables. Maxima can be followed by looking at the results of your station in your own back yard. If you live > latitude you should be seeing that temps. and precipitation are dropping. between  latitudes temps won’t change much during the current cooling period because of more condensation which releases great amounts of energy. Believe it or not: global cooling is here. This is different from what Vukcevik has been saying how? I am never sure how to give an interpretation of the graphs of Vukcevik in words. Perhaps we should ask him? 1) There is no evidence in the recent temperature records of minimum temperatures going back to 1973 suggesting that the emission of more greenhouse gases causes any “global warming”. To ride, drive or fly is safe for the environment! 2) A careful study of maximum temperatures of the recent temperature records reveals that Earth is most likely on an 88 year A-C wave, the so-called Gleissberg solar/weather cycle, with ca. 44 years of warming followed by 44 years of cooling. 3) There is ample evidence showing that the amount of irradiation that comes through the atmosphere varies due to natural solar- and/or solar-planetary induced weather cycles. 4) All major data sets including my own indicate that average temperatures have started to go down from around the turn of the millennium, meaning that global cooling has started from that time. My own data sets confirm that, in general, it will be globally cooling until around 2040. 5) A natural consequence of global cooling is a small (?) shift of cloud formation and precipitation, more towards the equator, on average. Whilst maximum temperatures will still be dropping, average temperatures around the equator remains more or less unchanged, largely due to more condensation energy coming free. 6) At the higher latitudes > it will become progressively cooler and drier, from now onward, ultimately culminating in a big drought period similar to the dust bowl drought 1932-1939. My various calculations all bring me to believe that this main drought period on the Great Plains will be from 2021-2028. It looks like we have only 7 “fat” years left…..